Huyghe Adventures Abroad: The best of Summer and Fall 2011.. The best of Summer and Fall 2011.. I love fall. It's my favorite season. 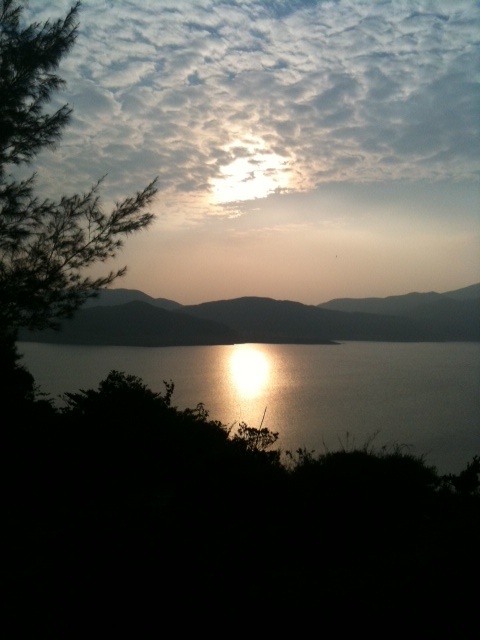 Even in Hong Kong where changes of temps are not so dramatic, fall is distinctively more comfortable than summer. The humidity is down and the skies are clear. It really is a great time of year! And the hiking! Every year I am amazed at the beauty of this area. A fantastic hike 2 weeks ago along the beaches of Sai Kung was just an absolute joy. We ended the summer vacation with a treat: we hired The Huan, a 90ft traditional Chinese junk (sailboat) and went on a 3 day cruise around HK islands. 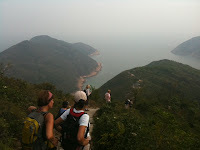 There are 260 islands around HK, many of which are uninhabited and only accessible by boat. Some of them have incredible geological formations and are protected under the "Geoparks" cultural and natural heritage laws. The cruise gave us a chance to visit some of them and swim at every stop. The water, once away from the Victoria Harbour area, is warm, clear and fantastic! The kids took every opportunity to jump off the sides. It was really nice. At night, we watched movies on the main sail under the stars "Swiss Family Robinson" and "treasure Island": you do have to keep with the ambiance! And we stargazed and slept under the stars. It was a weekend to remember! For my birthday at the beginning of September, we took a short trip to the Guilin - Yangshuo and Longshen areas where we biked and hiked around some amazing Chinese landscapes. The rices terraces here were just amazing, the Karst mountains so beautiful and I loved visiting the small villages only accessible by foot. The kids were great walking one day 20+km! It was a really nice trip. The more we see of China, the more we love it. It is such a beautiful country, the people are so warm and welcoming, the food is fantastic (really!) and the opportunity for outdoor activities are endless. Each region is different from the other, there will never be enough time to see it all. But if you have an opportunity, stay away from the big cities of Shanghai and Beijing and visit Lijiang, Shangri-La, Yangshuo, Longshen, Chengdu! All super. School started back and the kids this year are really well settled in the French system, the routine, the studying. Audrey no longer has language problems and stays consistently above average in everything which is such an accomplishment and Grant is "native" now, I even regularly have to remind him to speak English when his father is there.. Who would have thought! Grant was elected class representative by his class mates. He is quite the social butterfly. Audrey, "discreet" is what they call her here, quiet is what I say (!) as ever, concentrates on sports. Her soccer team has yet to loose a game this year; they have won every tournament they have entered. She also started long distance, cross country running, which here is quite an event with ups and downs of typically more than 2000ft each race. She placed 10th in her first race of 170 girls, and she was the youngest. The only one in her school to place (first 10 were medalled). Both kids have joined the scouts - a mixed troup that includes boys and girls from 8 to 18 years old. The troup is subdivided into Cubs, Scouts and Eagles, but meetings are common. Camps are regular almost monthly, last weekend was Audrey's whose scouts group hiked up Sunset Peak (really tough 3 hour walk uphill) with HUGE backpacks, carrying everything from tents to food. Grant's overnight is this weekend. He just turned 10 (!) I can't believe it! So all in all the kids are well and super busy. It is a joy to see how well adapted they are to life abroad. Steve and I continue to enjoy living here as well. Steve's business is developing by leaps and bounds, hiring new staff and picking new projects from Lebanon to China. Australia seems to be next in his sights. He does not travel much away from Hong Kong and enjoys having more time with the family. He even became assistant coach of Grant's baseball team! From what I gather, it is frustrating but a fun time with Grant.. I continue to keep everyone and everything busy and organized - which seems to take most of my time. Charitable Donations season starts in earnest after Chinese New Year in January, so I am enjoying the still relatively quiet time with my work. I have gotten into following some heritage festivals which have been great fun and a nice way to better understand the local culture. It is fascinating history dating so far back. My father and Ginette visited for 6 weeks during which time we went to Bali, Indonesia. We spent a week in Ubud which must be one of the most beautiful and spiritual places on earth. It was great. Than a few days in Lombok which did not turn out so fine, but an experience nevertheless! We saw (again!) every tourist spot in Hong Kong and some not so touristy.. They had enough time to see a lot of Hong Kong and enjoyed the diversity of our new life. We all look forward to our camping and hiking trip to New Zealand for Christmas, we will hike the Milford Track of Milford Sound, South island. Can't wait! Then my sister visits for New Year with her busband and daughter. Some more touristing on the books then! 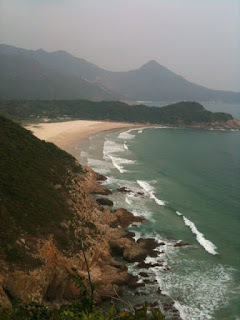 But seriously, there is so much to do and see in Hong Kong, it is always fun to take visitors around. Do consider coming to visit! You will have a great time. Here's an endorsement!